Huntsville Highlights May and June 2016 - Cooking With C.C. Since our last highlights post, we’ve visited a few other places in town that I wanted to let you know our thoughts. This is in addition to the new menu items at Bravo that I wrote about. Some big wine people we know told me about the Domaine South wine shop, so I had to go check it out. It’s a really small place, but don’t let the size fool you. They have a great selection of wines. It’s located on Cleveland St., just off Meridian in the AM Booth Lumberyard complex. They host a tasting every Saturday afternoon from 2-4PM. We tried two different weeks (the first week, I didn’t have the camera with me, so, gosh darn it, I had to go back to get pictures). The tastings are free and both that I have been to have had a wide variety of very good wines. They also have a number of gift items. It’s worth checking out. We don’t get downtown for dinner that often, so when we were in the area, we decided to stop in at Below the Radar for dinner. It has been a while for us and Chef Wes Walters continues to deliver excellent food. Lori loves a good Caprese Salad, so we started wtih their version that was available that evening. 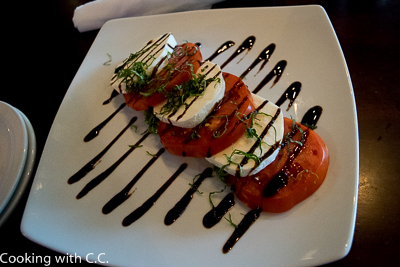 The presentation was very pretty with the balsamic drizzle and complemented the tomato and mozzarella very nicely. This particular evening, I had the French Dip Sandwich which included caramelized onions and Fontina cheese along with the au jus. I picked the house chips as a side and they did not disappoint. Lori went a little more mainstream and got the burger and fries. They have an excellent beer list with both local and other craft beers along with the usual suspects. Everything we excellent and we do plan to go back when we are down that way. I’ve heard a lot about the Boot Pizzeria, but with it being down in South Huntsville, I get down that way less than I get downtown. Luckily, I was invited to an event there with local author Katherine Knowles celebrating the one year anniversary of the publishing of her first book. The event was hosted at the Boot and they put out a buffet that let us try a variety of their dishes (and looked like a few things that aren’t on the regular menu). The pictures show a number of the dishes we had. I did not try everything on the buffet. I started with the Caprese and the Bruschetta. Both were very good although a bit under salted. The lasagna was my favorite and I had several “tastings” of that. I’m not sure exactly what to call the stuffed fried pizza dough items – I had two different ones with two different fillings. While I didn’t get to try the pizza itself, all of the dough I had was excellent and I would bet the pizza would be very good on it as well. After I took all the pictures, they brought out some other items. One was a very large calzone with several cheeses and sauce which I thoroughly enjoyed (once one of the other folks managed to cut it up). Later they brought out a dessert specialty – Panzerotti. This is the same pizza dough made into little squares stuffed with Nutella, fried and covered in powdered sugar. (Sorry, again I didn’t take a picture of this gem.) This dessert alone is worth fighting the southbound traffic on the Parkway at 5:00 in the afternoon. I enjoyed my first tasting of this place I heard so much about and I will manage to find my way back to South Parkway sometime. While I hate to write anything negative, unfortunately I must about this place. I didn’t plan on eating at the Royal Rose Diner, but I had scheduled a lunch meeting with the creative team working with my on the cookbook. We normally meet at Big Ed’s Pizza, however, I didn’t realize they weren’t open for lunch the day I planned. The Royal Rose was just across University, so we decided to try it. The building has housed many a restaurant and seems to be a doomed location to me. I had a bad feeling when I saw the menu – this menu would be the restaurant version of War and Peace – 14 pages long. When I saw it, my first thought was that no kitchen could execute this many different dishes consistently excellent, unfortunately, my lunch experienced proved my fears to be founded. They had a decent lunch menu, so I decided to try a good standby to see how everything went – Chicken Parmesan. The other folks ordered a salad and a kabob. (Sorry, wasn’t planning on writing so I didn’t take any pictures.) Service was extremely slow and spotty although it did take us quite a bit of time to read through the menu and make selections. The chicken parm was OK. Obviously, a set of menu items with fried chicken cutlet varying by what you put on top. A little cheese and marinara and you’ve got a Chicken Parm. It was served with a side of spaghetti with marinara. The marinara had minimal flavor and if I had to guess was not made on site. However, the lunch special was $5.95, so I guess not a bad value, but basic ordinary food. The folks I was with had a similar reaction. Their dishes were OK, nothing outstanding. We all agreed that Royal Rose would not be a place we would return. So there you have it, the wrap up of some of the places we’ve been in the recent past. Let me know if you’ve had different experiences or some other spots we need to try.